Debt is essentially just a way of bringing forward demand from the future. If I can borrow money today, I don’t have to wait till tomorrow to buy what I need. But, I do then have to pay back the debt – I can’t borrow forever. 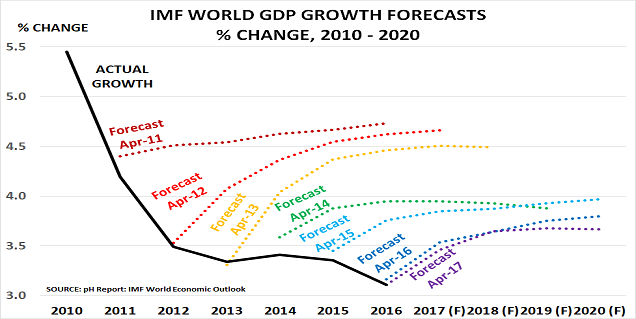 So high levels of debt inevitably create major headwinds for future growth. And meanwhile inflation, which was supposed to help the debt to disappear in real terms, has also failed to take off. US inflation last month was just 1.6%, and is probably now heading lower as oil prices continue to decline.  Then there is Japan, where Premier Abe came to power claiming he would be able to counter the demographic challenges by boosting growth and inflation. Yet as I noted a year ago, his $1.8tn of stimulus has had no impact on household spending – and consumer spending is 60% of Japanese GDP. In fact, 2016 data shows spending down 2% at ¥2.9 million versus 2012, and GDP growth just 1%, whilst inflation at only 0.4% is far below the 2% target. As in the UK and US, political risk is now rising. Abe lost the key Tokyo election earlier this month after various scandals. Voter support is below 30%, and two-thirds of voters “now back no party at all” – confirming the growing dysfunctionality in Japanese politics. WOULD YOU LEND TO A FRIEND WHO RUNS UP DEBT WITH NO CLEAR PLAN TO PAY IT BACK?  Japanese rates have risen from -0.3% to +0.1% today. 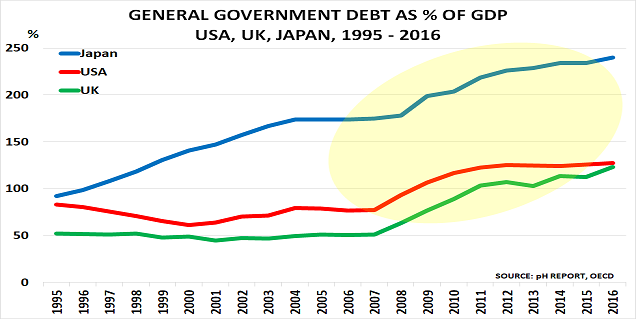 “To put it in a nutshell, if it’s a debt problem we face and a problem of insolvency, it cannot be solved by central banks through simply printing the money. We can deal with illiquidity problems, but the central banks can’t deal with insolvency problems”. White was one of the few to warn of the subprime crisis, and it seems highly likely he is right to warn again today.